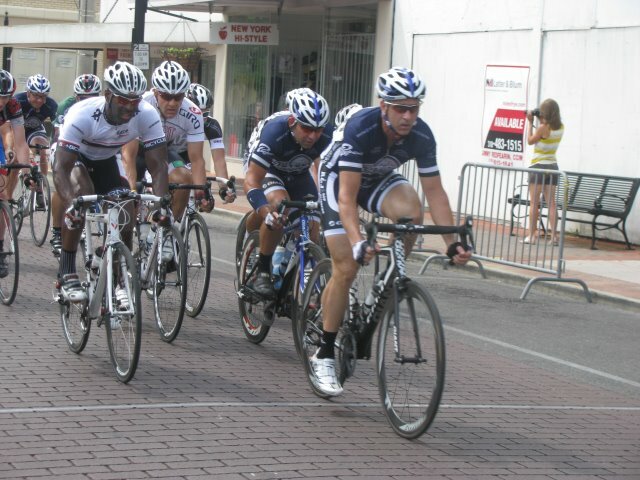 Thanks to the ABC riders who came out this weekend for Racing Rapides. Glenn took second overall in Masters with the support of our team-mates. Special thanks to Mark, Judith, Dion, Dustin, and Ryan Foster, who rode the unusually long sixty-four mile course. After a few miles, Kevin was in a break away with about four other riders. Meanwhile, Glenn and Ed disrupted rotations to protect Kevin’s lead. The break stayed away for about seven miles, until the pack started chasing hard. Mid-race, two 55+ riders launched a substantial and sustained break away. It took the combined effort of many riders to pull them back. This was really Kevin’s race. We were working for him, so he took one last opportunity get away. This time, by himself, with support from Glenn and Ed in the pack. All this before turning on to Long Leaf Scenic Byway. This fourteen mile stretch at the end of the race separated the climbers from the rest. By the approach to the 300 meter finish climb, there were only five riders, who had not been shed by the brutality of the landscape. Among them, Glenn Richard. An Oklahoma Velo rider led out the final sprint. Glenn, not usually a climber, gave it everything he had to beat the third place finisher by a wheel length. It’s always hard to do a time trial after a demanding road race. It’s not like getting on the bike with fresh legs at the beginning of a training ride. This would again be a test of climbing. Riders marked the decent with speeds of 35-40 mph or more. Glenn had an outstanding time to keep his top-three placing in the GC. Kudos to all of our riders, who brought the pain, even with mechanical problems. So the pressure was on Glenn for the criterium. Glenn needed four seconds to reclaim second place in the GC. Kevin, Ed, and Glenn made a plan and went in with guns blazing. Anything that went off the front, Kevin chased it down. The race was full of preem laps for either the 40+ riders or the 55+’s, all racing together. Unfortunately, everyone had to sprint for both, so riders would not get away. The 40+ hot spot followed the 55+. There was no time to set up for a lead out, but Kevin was there again, pulling for Glenn. In Masters, the race was supposed to be Kevin’s, but ended up working out for Glenn. That’s what working together as a team can mean in a stage race or any race. It’s about those who place, the unsung heroes, and all the riders who give it their best in team colors. Thanks again to our riders who turned out, we encourage all team-mates to join us in the upcoming LAMBRA races.